Step 1: Roll out clay with a rolling pin. 0.3 to 0.5 inches is a good thickness. 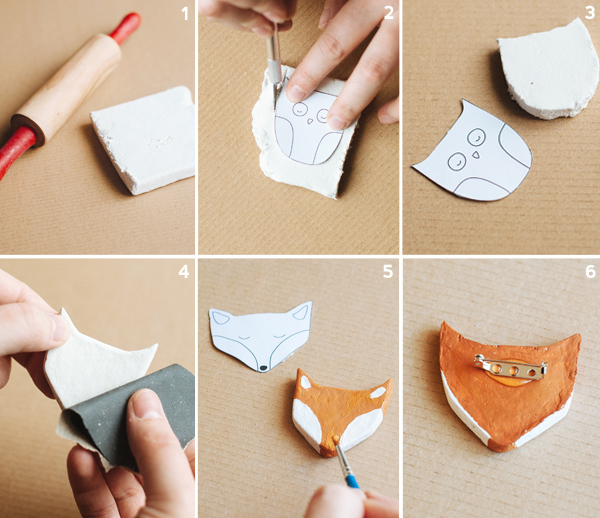 Step 2: Cut out your woodland animal templates, then lay them onto the rolled out clay and cut around with a knife. Step 3: At this point they don’t need to be perfectly rounded, but you can work the corners with wet fingers a little to make them more smooth. Then let your animals dry overnight, flip over and let dry for another 24h. Step 4: Grab some fine sand paper and smooth out any sharp edges and uneven bits. Step 5: With the help of your templates, paint on all bigger shapes with acrylic paint. Leave out the fine details like eyes and mouths. Let the paint dry, then add the facial details with a very thin brush. If you don’t feel confident with a brush, you could also use a sharpie. Step 6: Let the paint dry thoroughly, then attach a pin back to your animal with hot glue. Let cool and you’re done. Now you can pass these babies on as they are or make little personalized card backers for them. 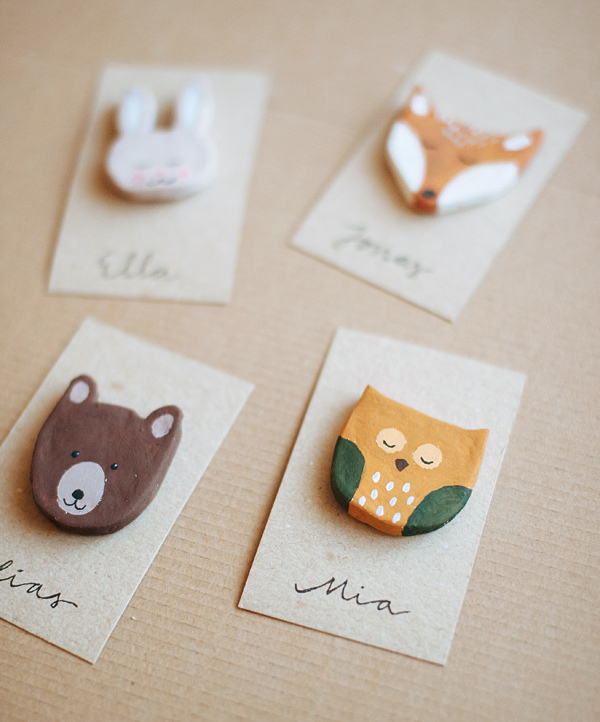 Simply cut card stock into the right size and pin the woodland creatures on. Add your guests names or a personal message to the backers and hand out to your guests! Omg! The cutest things ever! Love!! These are just so sweet, love this idea! The sweetest idea! Lovely (and fun). Oh these are adorable! 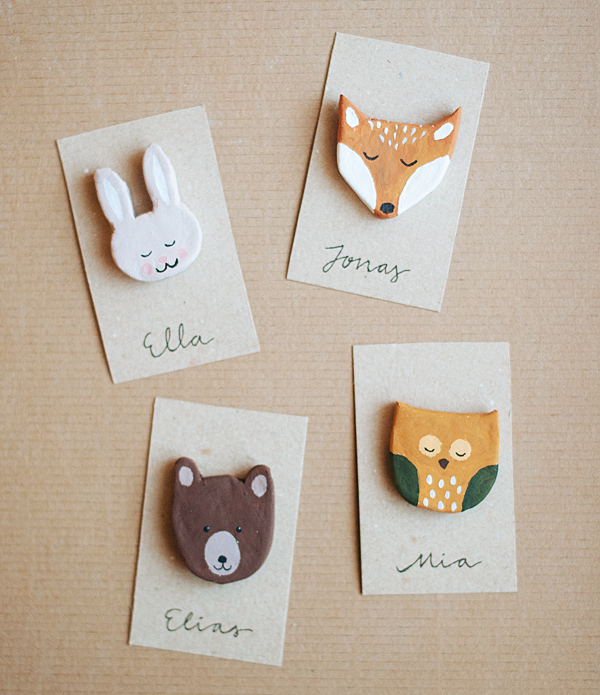 I’m completely in love with all things woodland right now – even blogged some woodland stationery treats last week too. These are totally gorg!! Have to make some for my little nephew :). Just fab! Perfect little treats for small folk! Thank you! These are so cute. Thanks for the inspiration.